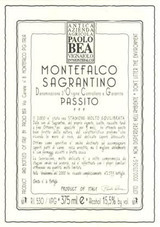 The Sagrantino Passito is made by leaving the grapes to dry after the harvest. A white mold forms that balances and concentrates the acid, sugar and tannins. This process usually takes 3 months. The grapes, as raisins, contain approximately 30% sugar at this point and they are then crushed. Fermentation begins and slowly progresses until the sugar level reaches 16% to 18% when pressing takes place with the resulting wine carrying about 90 grams of residual sugar. The wine is then aged in stainless steel and barrel.